Click OK below to begin the Mike Patton Discography. This timeline attempts to include everything that Mike Patton has been invovled with, and is a work in progress. You can subscribe for updates when new items are added. We also have two other smaller timelines. Firstly, the Mike Patton Album Discography, and secondly the Mike Patton Collaboration Discography. Epic was Faith No More’s second single released with Mike Patton on vocals. It has been their most successful single to date. A music video for Epic was released featuring the entire band. Look out for Mike Patton’s Mr. Bungle T-shirt in the video clip. Watch the Epic Music Video. Also listen to a instrument-by-instrument dissection of Epic here. Video Croissant is Faith No More’s second video which gave fans the music videos from We Care a Lot to Angel Dust. There were four different versions with extra songs on a special edition USA, European, and Japanese versions. The video also includes live footage and snippets of the band behaving badly. A laserdisc version of Video Croissant was released in Japan, however a DVD has never been released. Almost a month before Faith No More released King for a Day… Fool for a Lifetime they released their first single of the album, Digging the Grave. This was the worlds first glimpse at Faith No More without Jim Martin. Depending on the country the single included a combination of b-sides including Absolute Zero, I Started a Joke, Greenfields and Cuckoo for Caca. Ricochet was the second single released from the album, King for a Day… Fool for a Lifetime. Ricochet is often listed as ‘Nirvana’ on setlists as it was written the day that Kurt Cobain died. Mike Patton provides a cover of french artist Serge Gainsbourgh song “Ford Mustang”. He sings, arranges, and plays all instruments on the song. The song appears on a compiliation album put together by John Zorn’s label Tzadik celebrating Gainsbourgh’s music. Stripsearch was the final single released from Album of the Year, and the last single from an album before they broke up. The single was available earlier on a CD released with the 24th of May, 1997 edition of Kerrang. The song was created by guitarist Jon Hudson before being slightly altered by the rest of the band. The single contains three other live songs and was only released on CD. A music video for Stripsearch was released staring Mike Patton as the lead character. Watch the Stripsearch Music Video. A double DVD that includes Faith No More’s Live at the Brixton Academy performance, and the Who Cares a Lot – Greatest Video Hits video. The Kaada/Patton DVD, simply titled Live, is a recording of the full set from Roskilde 2005 as well as behind the scenes rehearsals and a photo gallery from the event. A live performance of the Fantômas Melvins Big Band (Mike Patton, Buzz Osborne, Dave Lombardo, Trevor Dunn, Dale Crover and Sir David Scott Stone), featuring songs from both bands. The video was recorded at the Kentish Town Farm in London on the 1st of May 2006. As part of The Melvins release of Sugar Daddy Live (2011) they released each of the 13 songs as a split 12″ record with their favorite bands. Sugar Daddy Live – Volume 10 is a split album with Fantômas, with a limited release of 800 records. The Melvins A-side is “You’ve Never Been Right (Live)”. The Fantômas B-Side is titled Sketchbook 1 which contains a number of Mike Patton’s demo’s for the debut self-titled Fantômas album, including Page 20, 16, 26, 9, 15, 2, 19, 25, and 7. The Fantômas demos were included in the Fantômas Wundkammer (2014) vinyl boxset as a bonus on cassette. Wunderkammer is a special edition vinyl boxset that includes the first four Fantômas albums – Fantômas, the Director’s Cut, Delirium Cordia, and Suspended Animation. It also includes a cassette with Mike Patton’s original demos of the songs that became Fantômas’ self-titled debut album. The demos were given to other band members so they could learn the songs. The box set was originally intended to be released as part of Record Store Day – Black Friday 2014. For Record Store Day 2016 Rhino Records released a side-by-side vinyl. Side by Side releases include the original artist and a band covering the song. On this release Faith No More cover the Bee Gees’ I Started a Joke. This is a vinyl only release and shouldn’t be confused with the 1998 Faith No More release of the same song. Mike Patton provides his vocals to the lead character in the animated short film The Absence of Eddy Tables. The film is based on the work of internationally acclaimed cartoonist and visual artist Dave Cooper. You’ll also recognise the name behind the score, Kaada. That’s right John Kaada who collaborated with Mike Patton on the Kaada/Patton projects also contributed to this short film. Listen to John Kaada talk about his involvement with the short film here. Edge of Twilight is a video game and was in development for nearly 10 years before it was released. Mike Patton provides the vocals and screams for the ‘Tainted Lithern’ in this steam-punk inspired game. Read an interview with the game’s developers. The vinyl had a limited release on the same day as Record Store Black Friday 2016 and was available in four colours – Clear, Green, Gold or Red. Faith No More recorded Sol Invictus using technology by SonarWorks called True-Fi. True-Fi allows listeners to hear music the way it sounded in the studio by customising the music to the type of headphones you’re using. You can sign up to receive a copy of Cone of Shame at SonarWorks. Nevermen released a special 7″ picture disc of the Boards of Canada remix of Mr. Mistake. Mike Patton provides vocals to a tribute to Connie Converse. Patton is joined by Alain Johannes on guitar. 1922′ was released on 20 October 2017. At the same time Patton’s PR firm advised that an extended score was being worked on to be released in 2018. Leave a comment below if there’s anything missing and we’ll add it to the timeline. The Mike Patton Discography Infographic for his Albums has moved. The infographic has moved to Mike Patton Album Discography Infographic page or click the image below to view the infographic. 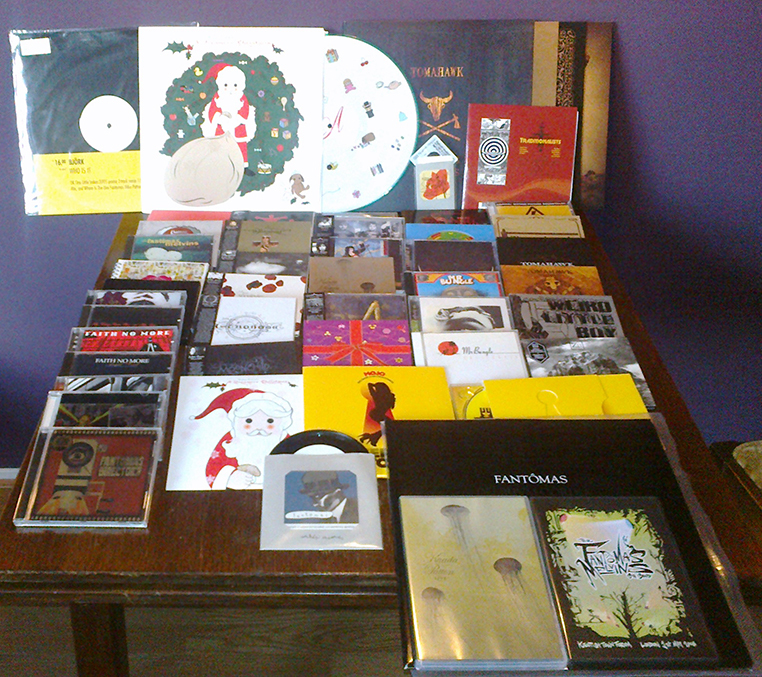 Nice to see : this was my collection http://home.planet.nl/~slotm048/mp.jpg in 2012 it has grown quite a bit since especcially in the vinyl department, but you might spot something you’ve missed? The albums in the 2nd column I can’t make out except for the John Zorn Christmas Album. The one between peeping tom and wlb is the album carboniferus by Zu with a patton song on it. Thanks, I’ll make sure they get included in the respective discographies. Thanks, i’ll get that added soon! There’s “The Perfect Crime” with FNM for the “Bill and Ted’s Bogus Journey” soundtrack, as well as, “Another Body Murdered”, a collab between FNM and BOOYAH Tribe on the “Judgement Night” soundtrack. I was just wondering if there was any information on when The Absence of Eddy Table will be available to view in the U.S. Ive only been able to find the teasers and would love to see the entire film. Unfortunately, we’re not sure when it’ll be released. Have you checked out the music video for Kaada/Patton’s Red Rainbow – this is made up entirely of footage from The Absence of Eddy Table.